As supplement companies increase their marketing strategies and reach, it becomes increasingly difficult to determine what supplements are worth taking and which ones are a waste of money. 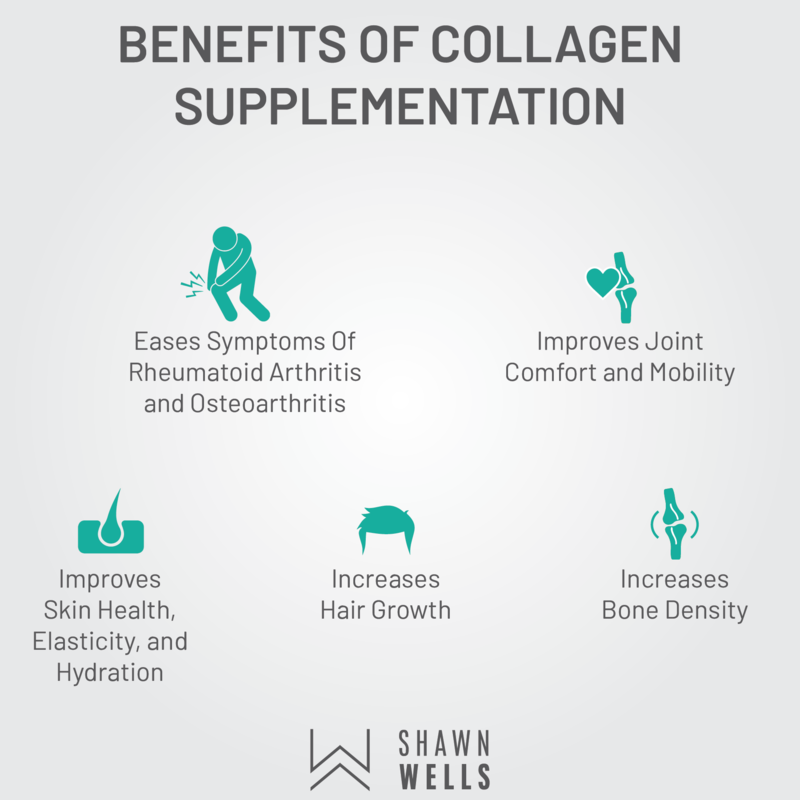 Indeed, while there are many ineffective, over-hyped supplements on the market, collagen is not one of them. In fact, supplemental collagen offers a variety of benefits to a wide variety of folks—ranging from healthy to aging populations—looking to optimize their skeletal structure. What is collagen? Collagen is the most abundant protein in the human body. In fact, thirty percent of the total protein mass in mammals is made up of collagen, a component of the extracellular matrix, which functions to bind other cells together (1)! 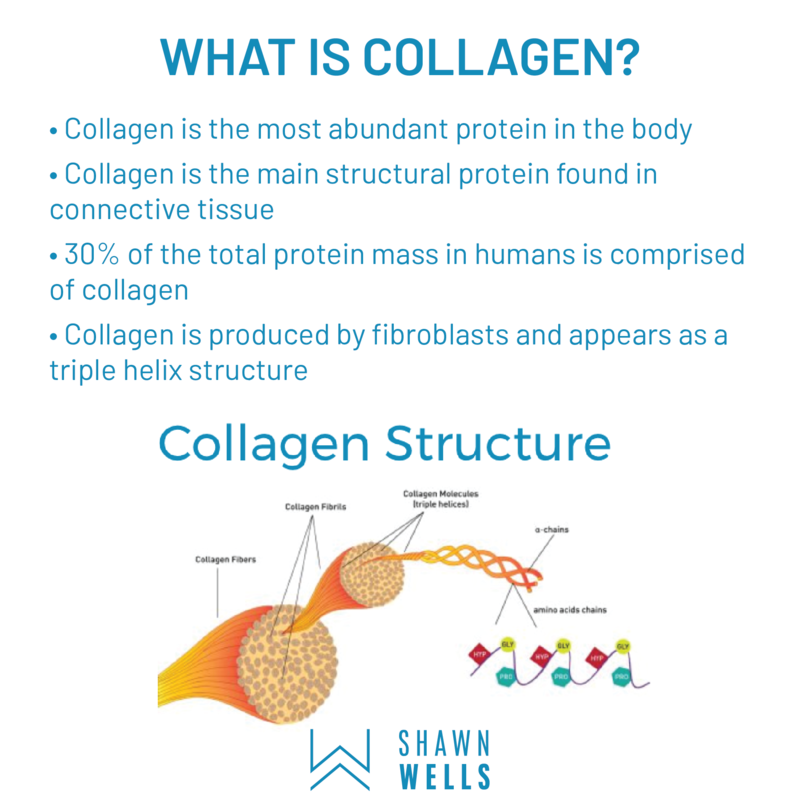 Collagen is the main structural protein found in connective tissue, such as skin, hair, nails, and joints. Chondrocytes, the only cells found in healthy cartilage, stimulate the production of collagen, which is essential to maintaining healthy bones and tendons, allowing us to move freely and perform activities of daily living. Thus, anything that reduces or impairs collagen production can greatly affect one’s ability to perform both simple and complex tasks. For example, it has been described in the literature that mutations of several genes, including COL1A1-5, may lead to reduced collagen production. The most common genetic disorders are Brittle Bone Disease (Osteogenesis Imperfecta) and Ehlers-Danlos Syndrome. The symptoms associated with these two disorders include fragile bones and flexible joint capsules, respectively (2,3). Although these are somewhat extreme genetic examples, there is a variety of factors (including less-than-stellar nutrition and a less-than-perfect lifestyle) that can decrease collagen production markedly as we age. Thus, proper bone and collagen health has received a lot of attention as of late, and fortunately, supplementing with collagen has been shown to have a variety of benefits. For instance, one group of researchers found that supplementation with native type II collagen for three months resulted in a significant reduction in swollen and tender joints in a group of 60 patients with advanced rheumatoid arthritis (RA). Based on this and other similar studies, it appears that only a small amount (10 – 40 mg) of native/undenatured type II collagen can have significant benefits on joint health (4). In another study, healthy individuals reported that supplementing with 10 grams of collagen hydrolysate for 24 weeks resulted in significant reductions in joint pain. Additionally, studies have shown that supplementation with as little as 5 grams of hydrolyzed collagen (and as little as 1 gram of hydrolyzed type II collagen) can improve skin health. It appears that supplementing with hydrolyzed collagen stimulates chondrocyte activity, which results in an increase in the body’s natural production of collagen (5). 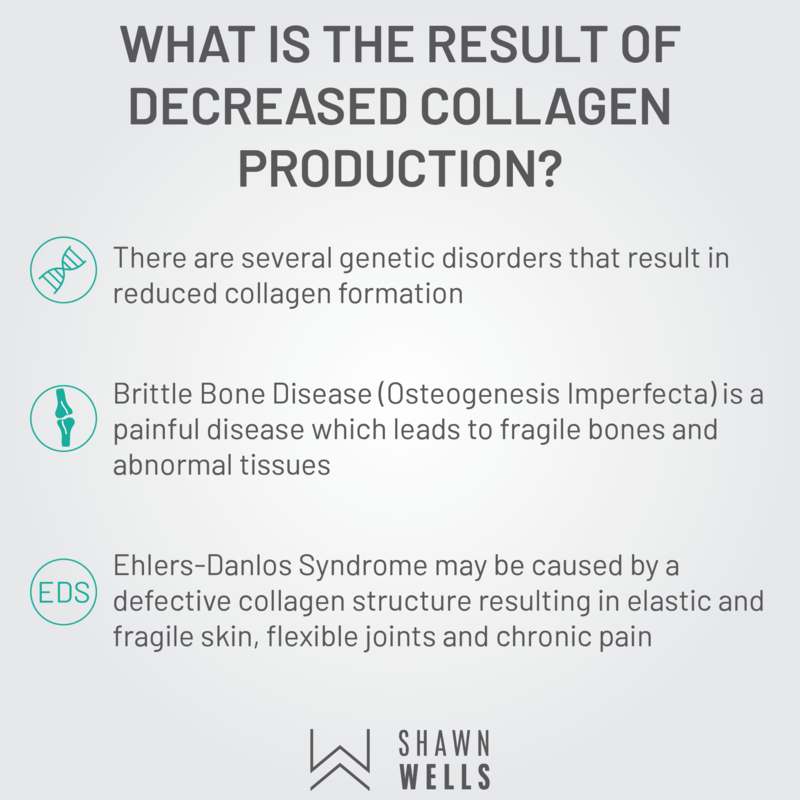 As mentioned above, aside from age and rare genetic mutations, there are several lifestyle factors that can contribute to a decrease in collagen production. These include excess exposure to UV radiation, inadequate intake of vitamin C (which is a cofactor in collagen production), smoking, and lack of sleep. On the flip side, there are also lifestyle and dietary factors that can naturally increase collagen production, including weight-bearing exercise, vitamin C, vitamin B3, vitamin A, and the amino acids glycine and proline (6,7). Collagen serves a variety of vital functions in the human body, and along those lines, it is one of the most abundant proteins. Being proactive and accounting for your collagen health early on can lead to a variety of health benefits down the road. 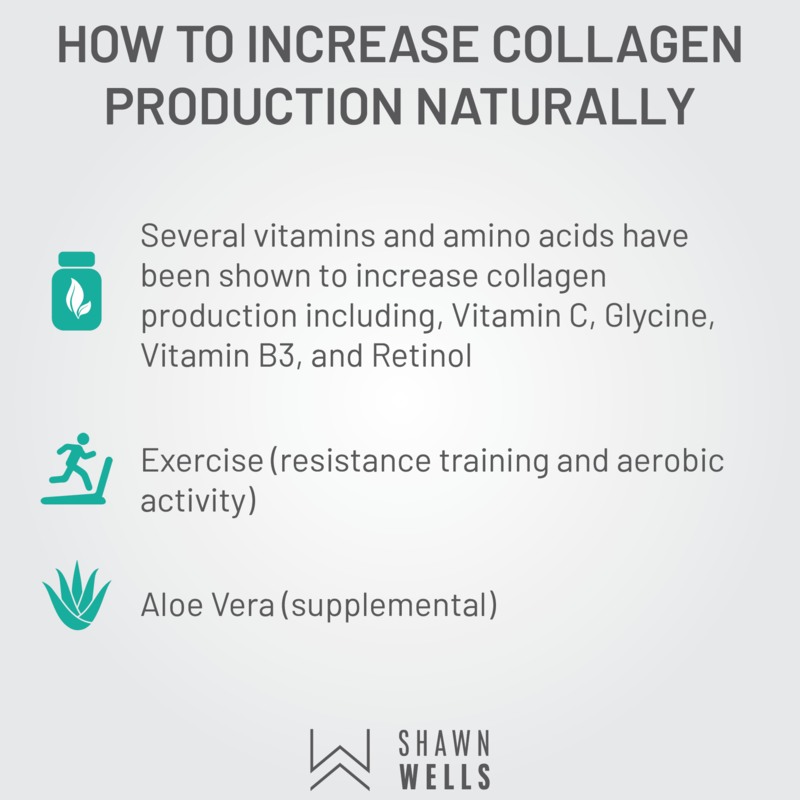 Consider adding collagen supplementation and/or some of the methods mentioned above to boost collagen production and optimize your structural health. Ricard-Blum, S. (2011). The collagen family. Cold Spring Harbor perspectives in biology, 3(1), a004978. Gajko-Galicka, A. (2002). Mutations in type I collagen genes resulting in osteogenesis imperfecta in humans. ACTA BIOCHIMICA POLONICA-ENGLISH EDITION-, 49(2), 433-442. Malfait, F., Wenstrup, R., & De Paepe, A. (2011). Ehlers-Danlos syndrome, classic type. Trentham, D. E., Dynesius-Trentham, R. A., Orav, E. J., Combitchi, D., Lorenzo, C., Sewell, K. L., … & Weiner, H. L. (1993). Effects of oral administration of type II collagen on rheumatoid arthritis. Science, 261(5129), 1727-1730. Clark, K. L., Sebastianelli, W., Flechsenhar, K. R., Aukermann, D. F., Meza, F., Millard, R. L., … & Albert, A. (2008). 24-Week study on the use of collagen hydrolysate as a dietary supplement in athletes with activity-related joint pain. Current medical research and opinion, 24(5), 1485-1496. Rittié, L., & Fisher, G. J. (2002). UV-light-induced signal cascades and skin aging. Ageing research reviews, 1(4), 705-720. SUOMINEN, H., KIISKINEN, A., & HEIKKINEN, E. (1980). Effects of physical training on metabolism of connective tissues in young mice. Acta Physiologica, 108(1), 17-22.